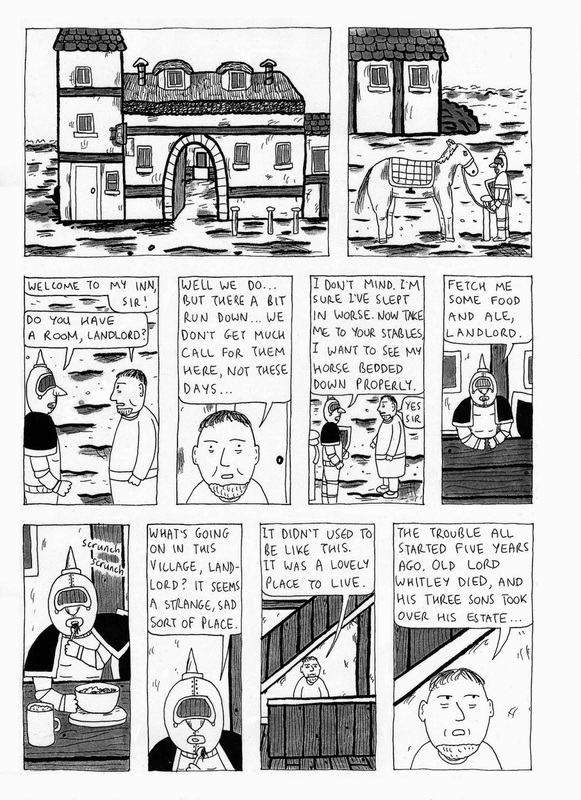 Rob Jackson's comics generally take on a skewed or absurd version of whatever genre they happen to be occupying, be it autobio comics, fantasy, horror, suspense, etc. This is not to say that he's not concerned with plot and developing a serious story; indeed, his plots are all rock-solid and entirely respectful of genre and genre tropes. It's just that his storytelling voice is so eccentric that he can't help but make them weird and funny. These stories are not really parodies and don't go for those kinds of easy jokes. Instead, Jackson has a knack for inhabiting the setting of a genre so intently that minor details are often blown up into become huge, ridiculous plot points. For example, in A Handful of Groats, Jackson weaves a story of a mercenary knight who comes into a village looking to make money. We eventually learn that the knight is a woman who's escaped being branded as a witch and thus keeps her helmet on at all times. There's nothing noble about this medieval world, as it's grimy, disease-ridden and generally unpleasant. The lords of the land and their enemy, a land-grubbing bishop, are all depicted as being stupid and vicious. The inn-keeper who helps the knight is a realist just trying to survive but also fully cognizant that his rulers will never stop fleecing him. From there, Jackson throws in interesting twists and turns, including another hyper-competent mercenary who opposes the protagonist, kidnapping plots, clever disguises and traps. The bishop has sharp, curved blades instead of hands, which is one of many funny details that Jackson drops into the story. Jackson rarely gives much thought to the inner lives of his protagonists except as far it will resolve the plot, yet the action is colorful enough for the reader to find out what happens to all of the characters. In his highly simplified style, he's able to get across a great deal of brutality and action in a manner that is frequently funny, thanks to this slight abstraction of ideas and images. It seems like Jackson was directly influenced by Sergio Leone/Clint Eastwood spaghetti westerns like For A Fistful of Dollars, in terms of tone and the dryness of humor. Jackson gets far wackier in his send-up of heist movies, Bradley The Tree Leaf. 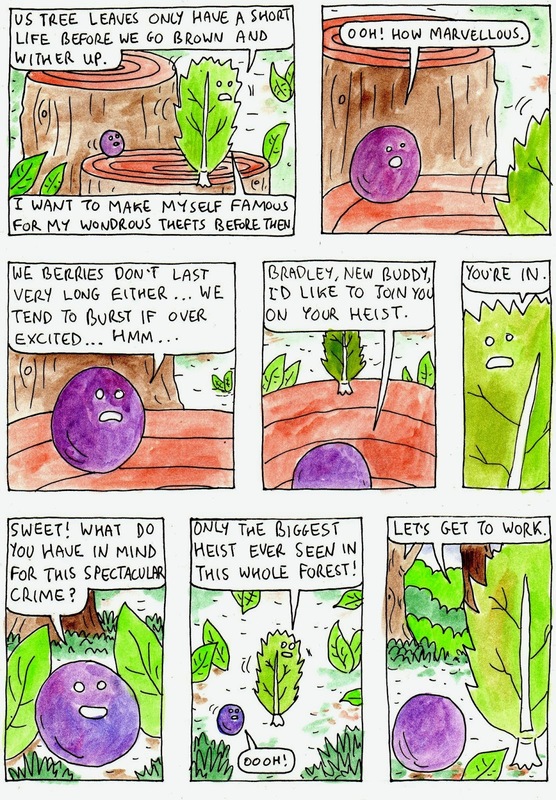 Available only on his blog, this is an account of a leaf that plans a heist of the Forest King's treasure from his highly secure juice factory. The leaf puts together a team that includes a safe-cracking wrapper, a blueberry, some rubber cement, a pair of mittens, etc. While the characters are all totally ridiculous, the action itself is once again quite serious in execution, as the various stages of the heist were clearly carefully thought-out and even suspenseful. Jackson's use of color adds a lot to the story, especially since there are a lot of details dependent on making references to color. Somewhere along the way, the comic becomes a political struggle thread, as the revolting fruit are led by a blueberry named Lenin Berry, complete with a little goatee. This one feels more improvised than Jackson's other stories, which takes away from the usual tightly-plotted nature of his stories but adds to this particular effort's fanciful absurdity. In flipping from children's story to heist to political uprising, Jackson is all over the map, but the deadpan nature of his humor somehow makes it all work. Jackson and another up-and-coming, uncategorizable artist from the UK, Kyle Baddeley-Read have started a new anthology called Rhizome, a science-fiction/fantasy themed work with some artists who make interesting use of their tropes. Max Mose's story about a group of aliens (ie, humans) going to a world run by intelligent dogs at war was both hilarious and typically thought-provoking. The hypocrisy of the people who were trying to steal the dogs' nuclear arsenal in the guise of trying to mediate their conflict was heightened when their theft was discovered and they wound up decimating them with a "hot lift-off". Mose's figure drawings are starting to become more economical even as he continues to mine EC comics narrative techniques. 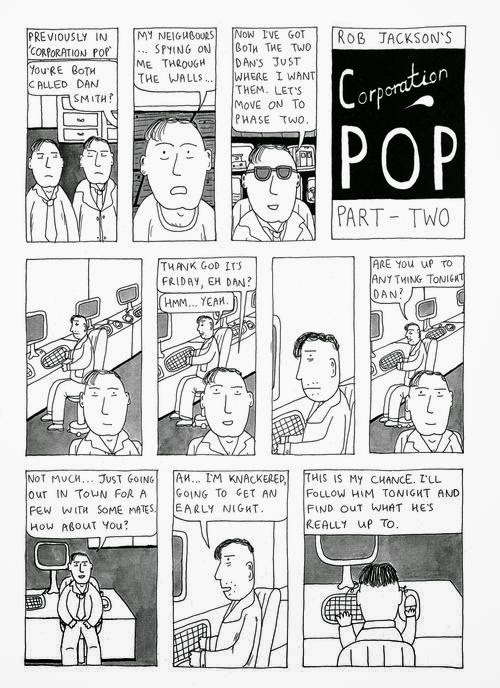 Jackson's "Corporation Pop" is a funny story about identity when a company hires two nearly identical looking men named Dan Smith. When one starts to have bad dreams and discovers a tiny camera in the empty next-door apartment, things start to get weird. The last panel reveals yet another Dan Smith, whose intentions seem sinister. Baddeley-Read's "Fingers" is his best-looking story to date. He loves to draw strange-looking children, and in this case, the children are toddling about, drinking something called Liquitin and living in fear of despotic robots who want to chop off their hands. This one gets its own EC-style shock ending after several pages of wonderful and awkward strangeness. Baddeley-Read's character design and screwy use of perspective make the action in this story especially weird. Irish cartoonist John Robbins is no stranger to dark, nihilistic fantasy-related fiction. In "Swallow Me Hole", we see a woman named Aileen talking to her therapist over time about a man she knew who had a small, black hole on his stomach. It looked like it was drawn on with a marker, but something about him and her future sightings of him made her extremely anxious--especially when the hole got bigger and he started babbling about "something coming". Aileen's therapist said all the right things about setting up boundaries, stigmata, Munchausen syndrome, a desire to change circumstances and other bits of sound advice--until Aileen reveals that she now has a hole of her own. The final panel, brilliantly set up by the seemingly-bland actions of the therapist during the session, reveals that not all paranoids are wrong. Robbins' sketchy approach and use of zip-a-tone contrasts the thicker and bolder lines of the other artists in the book, but it's a perfect fit thematically. Pete Batchelor's strip about waking up in the future only to encounter a nightmare has its own twist ending, but this one's just for laughs. Jackson continues to be an exemplar in publishing genre stories that are funny without resorting to parody, and his fellow contributors snugly fit into the satirical space pioneered by EC Comics as well. The biggest difference is that the art in this book is considerably rougher, more personal and idiosyncratic.